Forays of a Finance Foodie: Specialty Food Association Holiday Taste Test: Enjoying Unusual Gourmet Products Perfect For Holiday Meals & Snacking! 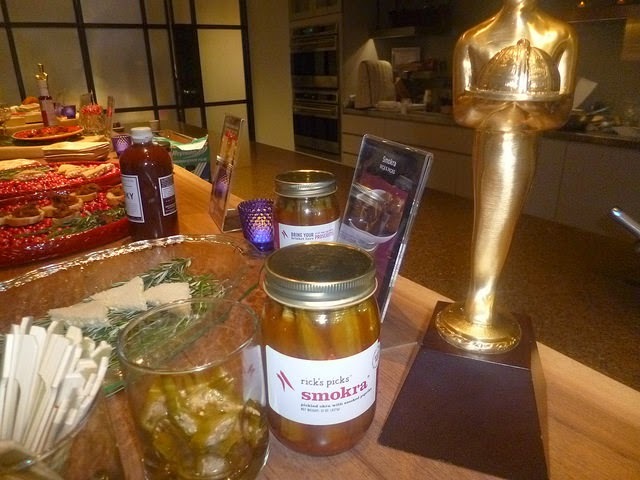 Specialty Food Association Holiday Taste Test: Enjoying Unusual Gourmet Products Perfect For Holiday Meals & Snacking! Nine sweet and nine spicy gift ideas were presented for tasting at an exclusive event on the offices of the Specialty Food Association recently. In case you don't know, they're the folks who bring the wonderful Fancy Food Show to New York and San Fran (and occasionally other destinations) each year. 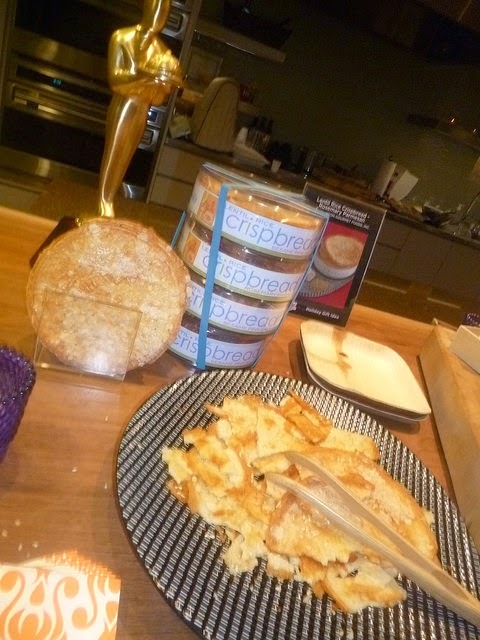 Guests included the entrepreneurs behind two of the products: Rick Fields of Rick’s Picks, with Smokra, and Kate Pratt and Michel Mazuret, the duo behind East Hampton Gourmet’s gift-worthy, and gluten-free, East Hampton Gourmet Crispbread. I carefully tasted each and every product and come up with my favorites--and noticed that my sweet tooth won out although Rick's Picks Smokra knocked me off my feet and I took the advice at the side of the jar (which was to pair it with prosciutto), so I teamed it with the SOFI winner Prosciutto Di Parma which I happened to have in my fridge (you can buy it at Eataly for about $24 per pound). I usually team it with Trader Joe's roasted yellow and red peppers in a jar, but the okra put an extra "wow" factor in the prosciutto (the spiciness/smokiness of the okra mixed with the saltiness of the ham is mind-blowing, but I find all of Rick's Picks to be pickled veggie masterpieces). 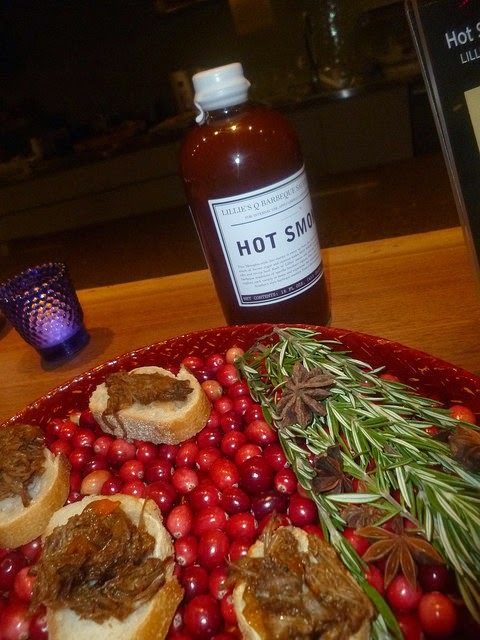 Also in the "smoky" department, I was blown away by Lillie's Q Hot Smoky BBQ sauce, which was served on pulled pork. East Hampton Gourmet Lentil Spice Crispbread was a winner with any type of cheese and cured meats and I loved all four flavors: Rosemary Parmesan, Sesame & Pink Salt, Cheddar Chipotle and Everything! Who knew so much flavor and fiber could be packed into one super thin wafer! The buttery and crunchiness of William McGrain Heritage Lemon Infused Shortbread led me to eat five pieces while at the event, It's made with the classic shortbread recipe with real lemon juice used--these shortbread squares are totally natural with no preservatives. I would like to have some in my Christmas stocking because they're such a treat and I'd love to try them with ice cream or gelato next. Keeping on the sweet tip, I also devoured a bunch of Effie's Homemade Cocoa Cakes With Toasted Coconut. As the package says, they work as "a biscuit for tea...a cracker with cheese...and as a cookie that's light and tasty." I loved the soft milk chocolate taste mixed with natural coconut--and the firmness! There is a loud crunch when you bite into these, and I would say they would stand up to dunking in tea, coffee or hot chocolate. They would also make great crumbles on top of ice cream. The Grey Ghost Bakery provided their now-legendary made-from-scratch Chocolate Cayenne cookies made with country bacon and those had a kick I will not soon forget! 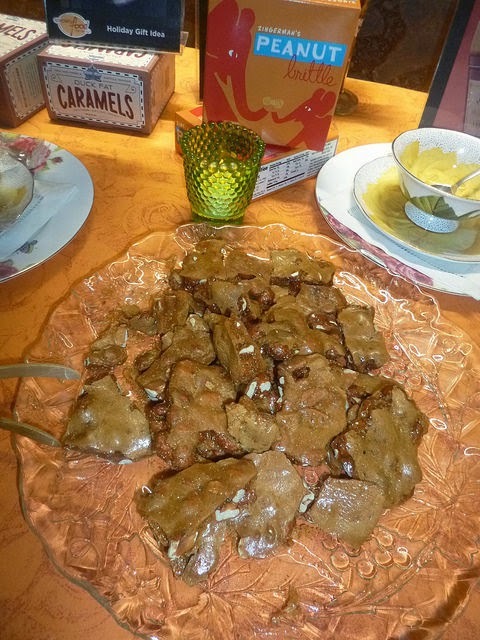 I then sampled the outrageously good Zingerman's Peanut Brittle, which is all natural, hand pulled and homemade. This peanut brittle is so buttery and tastes like it was made the same day even though it comes in a box. There are no preservatives and the flavor is as good (if not better) than Grandma's. I admit it--I ate a dozen pieces of this. It was highly addicting and the journalists/bloggers around me could not control themselves either! The Olive & Sinclair Duck Fat Caramels is a big award winner and I have to say that I never had such rich, chewy caramels. Not surprisingly, these are made in Nashville and the company also makes Chocolate Salamis! 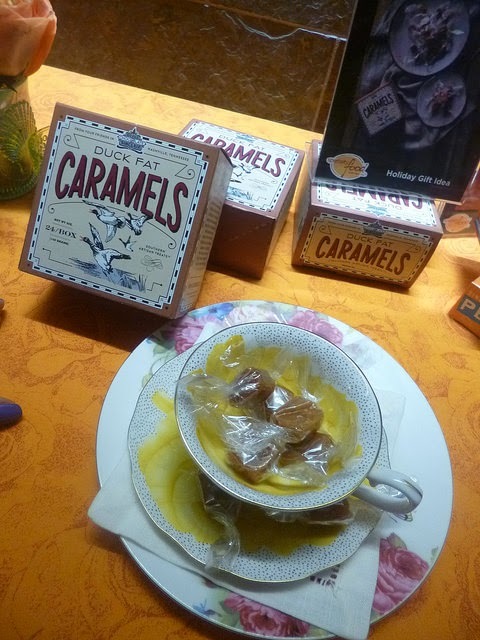 I loved that at the Specialty Food Association event, the caramels were served out of a vintage tea cup on the display table! I fell in love with Bissinger's Spicy Catalunya, which is 75% dark chocolate mingled with hazelnuts, smoked chili and a touch of orange. This is very much an "adult" chocolate taste as this bar is not very sweet. Even though I generally prefer milk chocolate, this bar was a winner in my book because the Seville Orange taste is so natural and so strong. This is an awesome stocking stuffer for the adult chocolate lover in your household who wants to try the great varieties of flavored dark chocolate out there. They won't be disappointed in this! I hope to get invited back to this tasting event next year! It's so nice to mingle with makers of your fave go-to products and I enjoyed chatting with Rick from Rick's Picks--I even made some suggestions of new items he should pickle and put on the market! I’d love to see him do some baby veggies like mini-squash. Teapigs provided gourmet caffeine free tea at the event in an exciting flavor called Spiced Winter Red Tea! The beloved Republic Of Tea provided the wonderful Downton Christmas Tea which is black tea and comes in a gorgeous deep red tin featuring (you guessed it) The Downton Abbey cast and features a bit of a cinnamon and clove taste. The tea’s aroma was amazing. Seems that spicy everything is the trend for Holiday 2014 food trends, both in beverages and sweets!